Ryan Gosling stars as the infamous American figure Neil Armstrong in Damian Chazelle's cinematic biopic "First Man". “First Man” is one of those movies that you don’t really appreciate fully until you’ve left the theater. I chose to see Damien Chazelle’s new Neil Armstrong biographical drama at 11 at night (a mistake), and right off the bat, it wasn’t what I expected. While I went into the film expecting a tribute to one of America’s most iconic figures, I was instead faced with the jarring realities of a life singularly devoted to the infamous space race. The film sheds light on the unseen life of the ‘first man’, revealing the motivations that led Armstrong to throwing himself into one of the most dangerous feats in American history: putting a man on the moon. DO see this movie on IMAX. Created for IMAX and previewed in festivals on an IMAX screen, seeing it in this format is the only way to get the true First Man experience. DON’T see this movie at nighttime/if you’re tired. Because of the drawn out, silent shots of space, it will lull you into a relaxed state that makes you feel extremely guilty when you start drifting off. DO bring a friend who, if you start to doze off, can hit you to wake you up so you remember enough of the movie to write a review. 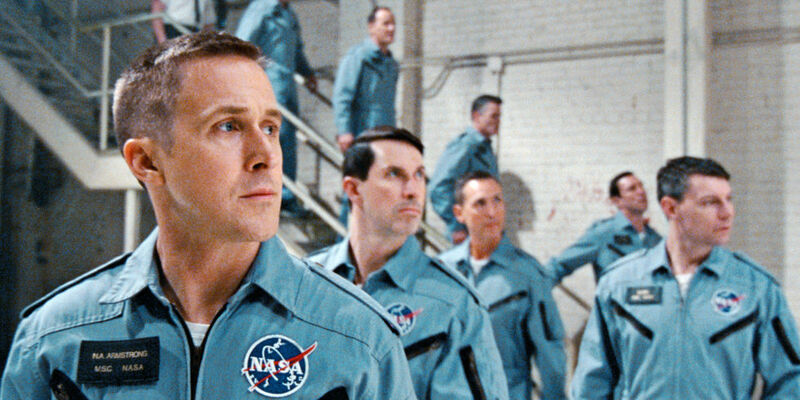 As someone who’s a huge space nerd, I was over the moon (ha) when I heard Damien Chazelle and Ryan Gosling were teaming up again, this time focusing on the space race. In the 60s, the space race was portrayed as almost excessively glamorous, a monumental feat for the country, and was a staple of American entertainment, the families of the astronauts becoming rockstars and the astronaut’s missions televised with millions watching. A couple of years ago, I watched a series called “The Astronauts Wives Club”. This short-lived series based off of the book of the same name focused on the wives of the men who participated in these dangerous programs, and examined the reality of the lives of these women and their children waiting at home. However, this examination was ultimately surface level, and it moreso showed the parties, the white house visits, and the media exposure, focusing the camera on astronauts at the pool and their wives giggling over wine and gelatin molds. “First Man” shows many of those scenes in dramatically different lights, and I was impressed by how deeply the film focused on Armstrong’s tormented psyche during this nationally glamorized time. Because of this, the film took a very grim tone from the start, with the death of Armstrong’s young daughter as the throughline of the story. A fact that isn’t commonly known in American history, Armstrong had a daughter named Karen who passed away from a brain tumor shortly before he joined the space race. The film is very devoted to evaluating the impact that this tragedy had on the famous astronaut. After Karen’s death, the Armstrongs move to Houston and Neil begins the astronaut program. Neil is a stoic figure, never wanting attention directed at him, never acknowledging himself as the “American hero” America wanted to broadcast. Gosling delivers one of his best and also one of his most understated performances, toning it down to play the famously reserved astronaut. It’s an investigation into not only the character, but masculinity at the time, emotions expected to be held behind a thick screen even under the extreme amounts of stress the astronauts were exposed to. Claire Foy, who plays Neil’s wife Jane, is also excellent, embodying the anxiety and torture of being on the ground when you have a husband in space. One of the best scenes of the film is when Jane begs Neil to say goodbye to their children before he leaves for the moon, asking him to tell them that he may not come back. The film is largely comprised of stunning shots of the galaxy and gripping flight sequences straight from the cockpit, the cinematography as the vantage point. There are moments when the film is completely quiet and the camera rolls on a shot of the moon’s surface, or we see the same wide expanse of stars and blackness that the astronauts saw (hence why it’s not good to watch when you’re tired). Back on ground, the dramatic scenes play out, bringing light to the dark and unknown realities of what putting a man on the moon meant to the families that sent their husbands off to an extremely dangerous job. The highly anticipated moon landing is a beautiful piece of film that is as monumental of an accomplishment for Chazelle as the landing itself was in 1969 (by my objective standards). Not only is the landing portrayed as a monumental feat; the beautifully crafted sequence allows for both appreciation of the final frontier and somber respect for the emotional impact. One of the final scenes is of Neil on the moon in an intimate moment not broadcasted on the news, a very personal tribute that brought tears to my eyes. First Man is a very raw portrayal of the space race, focusing the heart of the film on the iconic historical figure who walked on the moon. In response to pushback on certain elements of the portrayal of historic events, I say that this is a movie about Neil Armstrong, not America. And it succeeds in giving the American public a more well rounded view of a figure that they believe they know.